Workers on a site in south Dublin were recently stunned to discover the remains of approximately 60 people. This isn’t a horror story; these remains date back to the Bronze Age (2500BC to 500BC). The site had been earmarked for housing, but it is now an archaeological dig. The 16 acre site, former home of politician Liam Cosgrave, is in the Dublin suburb of Templeogue on the south side of the city. Ireland boasts much evidence of our ancient ancestors, and the carvings and jewelry they left have inspired the motifs on many Irish gifts. Archaeologists have since discovered much more than the bodies. The find includes evidence of a ring fort and signs that the site was used into the Iron Age. But details have been hard to come by, and Irish papers have reported that locals have been seeking information for months. Evidence of a dig was apparently from October, but the find was only announced at the end of January. It is still unclear what will happen to the site, which was to be the location of a new housing development. Some advocates have suggested the bodies should be left in the ground undisturbed. Bronze Age Ireland was very sophisticated. Our ancestors understood astronomy and geography well, and they made tools and ornaments with great skill. Evidence suggests they traded internationally. But life was also extremely violent then, and appears to have involved human sacrifice. While it is known as the Bronze Age, this period in Ireland is also known for producing amazing work in gold. Ireland has more Bronze Age gold hoards than any other country in Europe. Another one was found in County Donegal just last summer. That find consisted of several gold rings. In the early Bronze Age, goldsmiths worked with sheets of gold to make ornaments such as lunelas, crescent discs that were worn around the neck, and gold discs that were attached to clothing. These items were typically decorated with rows of dots, crossed lines, triangles, zig-zags and similar lines. 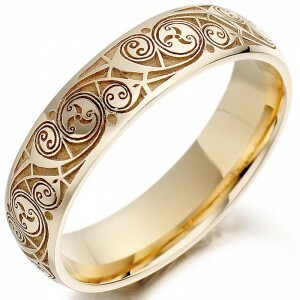 The influence of Ireland’s earliest artisans reverberates through the centuries and can be seen in modern Irish gifts, particularly Celtic jewelry. Gold never went out of style! In the late Bronze Age, people buried hoards of gold and other items in some sort of ritual. It is unknown if this had religious significance or was primarily to keep the items safe. Researchers have also uncovered more weapons from this era than earlier parts of the Bronze Age, suggesting that there was more conflict then and perhaps more theft of precious items. For now, Ireland is waiting to see what else will be uncovered in Templeogue and what we can learn from it. This is a very significant find, and potentially could give us great insight into our ancestors, how they lived, worshipped and died. We could even discover new motifs to inspire today’s Irish gifts.